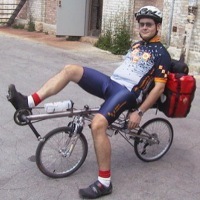 At Jaco Unlimited, we build folding recumbent bicycles. In under 10 minutes, you can fold one of our bikes and put it into a suitcase. You can take it on an airplane as checked baggage or put it in the trunk of a car. Then, you can unfold it and be on the road again in under 10 minutes. Best of all, it's a great bike to ride!